FLORA - MURALS - KIDS ROOMS - KIDS ROOMS - BEN 10 - BEN 10 AND ALIEN HERO SWAMPFIRE - KID ROOM MURALS. 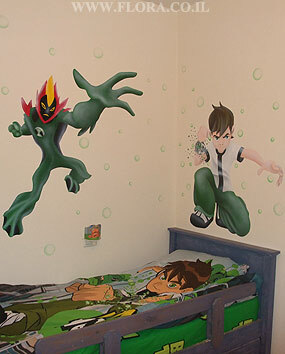 Ben 10 and alien hero Swampfire - kid room murals. Omnitrix Aliens Swampfire is a Methanosian from the planet Methanos. Swampfire is a plant-like alien with a fire-patterned head. He is described as a living swamp.Muralist: Flora. Location: Mazkeret Batia.